Introduction: In this post I will explain how we can recover the lost/forgot password via email in asp.net. In the last post I have explained How to Create Login Form in Asp.net OR Login Form with Check Username and Password aviabilty in Asp.net, How to create registration page in asp.net. Users click on forgot password link and redirect to forgot password page. 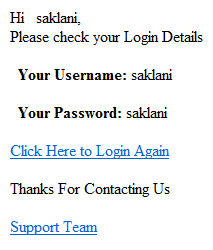 There user enter their Email Id and get their password details via Email. <asp:Button ID="txtsubmit" runat="server" Text="Send" OnClientClick="return ValidateEmail();"
msg.Subject = "Your Password Details"
Please Upload Project, i Have error :( ! !